Green Garnet is considered a powerful healing gemstone for the heart chakra and is able to remove toxins, negativity, and traumas. 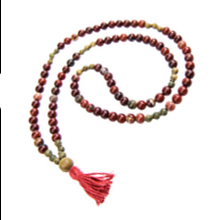 This prosperity stone increases confidence, tranquility, gratitude, and compassion. Buffalo horn beads are considered a symbol of gentle strength, determination, and friendship.